How do you know if someone has gone for a run? Don’t worry, they’ll be sure to post a picture on social media. Isn’t that true? of running then I guess it didn’t really happen. If you follow me on IG (where I got use to posting my runs), you would notice that there hasn’t been a running post since Christmas Break (actually it was the first day of winter). 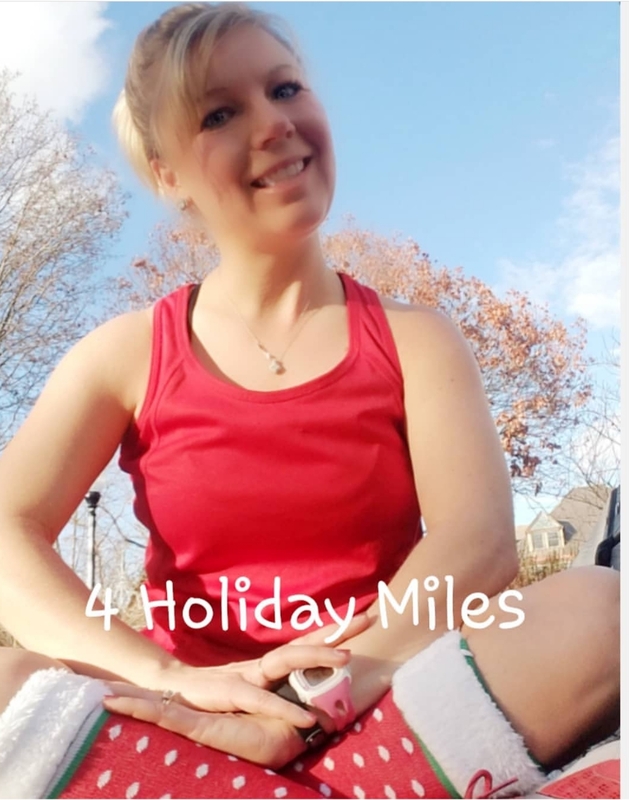 I thought perhaps I would keep up at least one run a week, maybe run the Holiday race The Running of the Elves 5K and then run the St. Patrick’s day race too. I Runfess none of that happened. I guess I could blame it on the weather, but I’m not going to. I love running, but I found something else I love more. Baylee. Now, I always knew I loved Baylee more than running, that is not a new discovery. However, by January Baylee came down with some health problems that required more attention than normal. I worried about her night and day. When I got home after work, the last thing I wanted to do was leave the house again for a run. 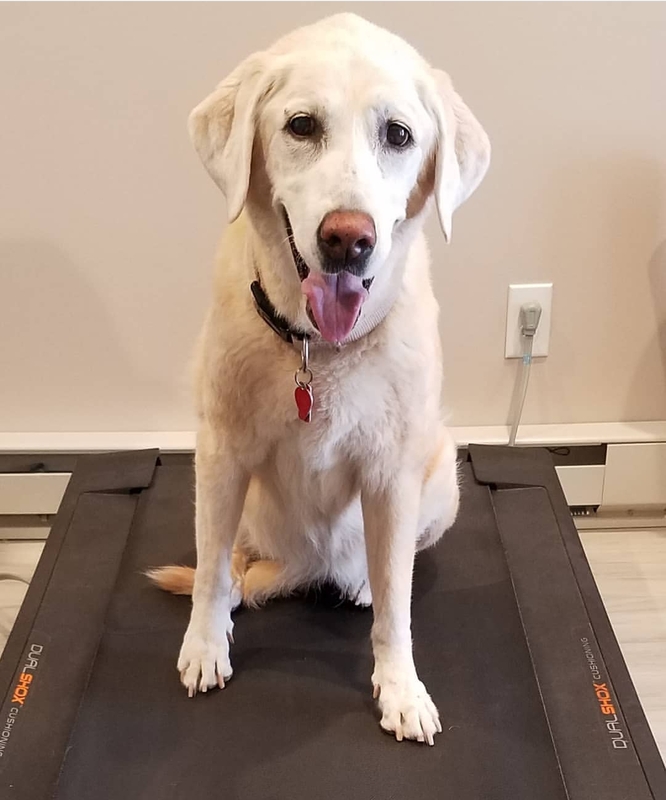 You would think this would have been the perfect time to fire up the treadmill, which it would be except the treadmill is located downstairs and Baylee is now hesitant to go up and down steps. I didn’t want to be on one floor of the house for an extended period of time and leave Baylee on another, so treadmill running was out! So really, my activity level was non existent. Even on the weekends I didn’t feel like doing anything. Taking care of an elderly dog is exhausting. I think being a care giver for the aging in general (for animals or humans) takes a toll on you mentally and physically. You do the best you can just to keep them comfortable even though you know they will never be “better”. It’s hard! However, I kept telling myself that I did not miss running and that being home with Baylee is right where I wanted to be. And that would be a true statement, until we started getting those 70 degree days. Then I started to get the itch to want to run again. I don’t want this to sound like a sad post, because it isn’t. I just wanted to share with you all where I am right now (since this is still a “fitness/healthy living” blog). However, the Spring weather has really perked up my spirits and is now allowing me to “live” a little more. 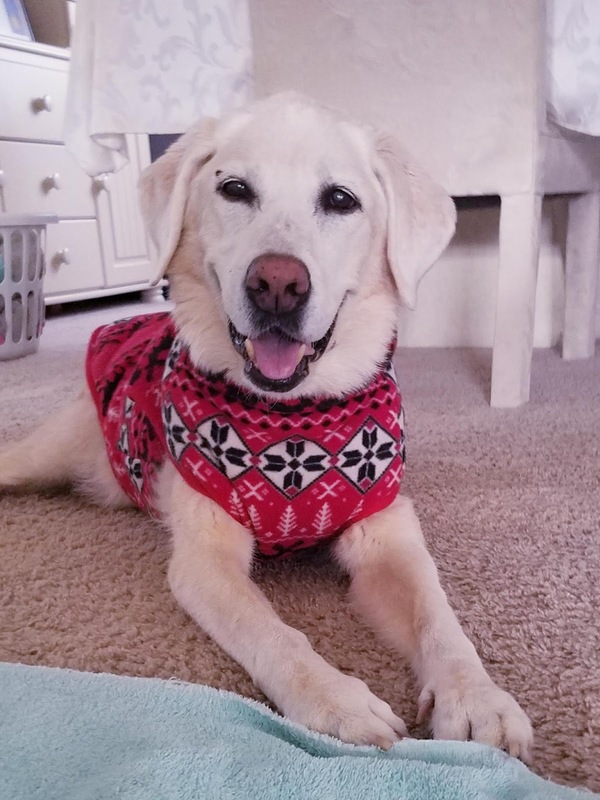 Since Spring arrived, the snow and ice have all melted (what a blessing) so now Baylee can actually walk all the way around the yard without the fear of slipping, which would allow her to enter the downstairs room through the back door. No stairs needed! I have my treadmill buddy back again! Also, I bought something that is going to be a MAJOR GAME CHANGER this season and into the summer. I bought Baylee a doggy jogging stroller! One of the biggest reasons I don’t run is because it is a huge time commitment and I hate taking that time away from Baylee. We’ll now she can come with me! I’ve taken it on a few walks so far and she has done well with it but I hope to talk about it a little more later. Just know I am super excited about this. Yes, I Runfess that I may end up being that crazy dog lady. Has there ever been other commitments that kept you from running for an extended period of time? I totally get it. I’m “lucky” that all my furkids are small. I was able to carry Chester up & down stairs. I also had a lot of walks where I carried him, too — although it’s amazing how heavy an 8 pound dog can get! I don’t know how moms do it! Gizmo couldn’t really go up & down stairs. We moved all the litterboxes upstairs — one even by our dining table because he made it clear that’s where he wanted it. The sweeping was never ending. It IS very difficult. It IS exhausting. And it only ends one way. 😔 i’m Glad you’ve found a way to get in exercise but because it’s really important. Hugs. Baylee has lost so much weight that I am able to carry her for a bit now when needed. I certainly cant walk with her though! It's so hard when our pups age or suffer. I'm sure Bailey will enjoy riding in that jogging stroller! I have seen those before. Glad you get to run again! Thanks Wendy! I'm looking forward to spending time with her this way. Aw, he looks so happy in the stroller! That's such a great idea. Time is a precious resource and you have to spend it on what matters, and it makes sense to prioritize time with Baylee over random runs. Yes, that is exactly what I was thinking! Awww...Bailey is lucky to have you to take such good care of her. 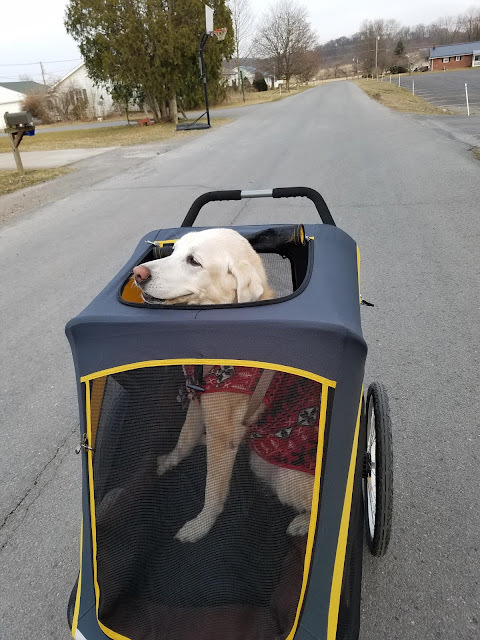 I used to run with a running partner who pushed 2 dogs in a double stroller. They were little dogs, so she just strapped them into a regular jogging stroller and off we went at 4:30 a.m.! Good luck returning to running. Looks like Baylee is back in action with that stroller! I'm glad you are getting your run on again. That has to lift your spirits and help you to take care of yourself and Baylee better! Yes, it really does help me feel better about a situation I have little control over. The dog stroller is so cool and Baylee looks so happy in that photo! That's good news that you're able to get back to running now that the weather is getting better and Baylee can join you. You're right, being a caregiver is really draining. I think the warmer weather will be a blessing and cant wait to get outside with her again. Its tiring staying in! Bring on all the sun!!!! I love you know how valuable your time is with your girl... she's just the cutest little thing! Aww that story about Bruno makes me sad yet happy at the same time. We sure do love our fur babies. I love Baylee's smile! It is challenging with a senior dog, that's for sure. I'm glad the weather change and the doggy stroller will get you both outside, together. I hope you guys have lots of good times on your runs! Thank you Shelly, the few walks we took went well so I hope she continues to enjoy it. The dog stroller is going to be great! What a good way to spend time with Baylee - and get a stellar arm workout! Haha, I forgot about it being an arm workout! Awww sweet girl! She's so cute in her new jog stroller. I hope she loves it. Caring for aging pets definitely takes a toll. Saying goodbye to Carlo in January was so tough but it was only after he was gone that I really realized how much work it is. I bet pushing a dog Bailey's size in the doggy stroller will be a killer workout! I hope she loves it. Should you try Acupuncture for your Dog?